You may receive updates from Massachusetts Education Justice Alliance, the sponsor of this form. 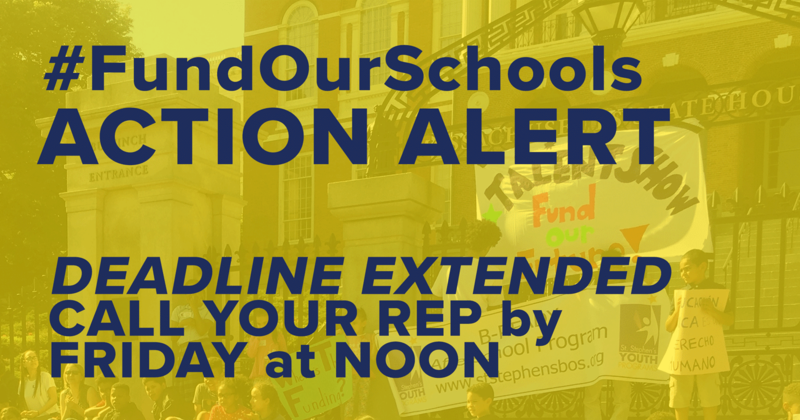 UPDATE -- June 7th at 9PM: We have 87 state reps signed on to Rep. Aaron Vega's letter demanding a vote to update the Foundation Budget and #FundOurSchools. The deadline to get people to sign on is now extended to Friday, 6/8, at 12 noon! We need to get 20 more reps signed on! Two weeks ago, the state Senate set historic precedent by unanimously passing the Foundation Budget Modernization Bill, which would greatly improve the school funding formula and help #FundOurSchools for every child across Massachusetts. Republicans and Democrats alike came together to say that if our constitution claims we as a Commonwealth cherish public education then we must also fairly, equitably and fully fund all our public schools. It’s time for the House to Pass An Act to Modernizing the Foundation Budget for the 21st Century! This bill has been supported by more than 120 members of the legislature through its time on Beacon Hill. Now is the moment for our State to make history and provide the students of the commonwealth with the funding each district needs. Can you call your representative and ask them to fully fund our public schools? The Foundation Budget Review Commission three years ago put out its recommendation and we as a state cannot allow another class of students to graduate without the proper funding their districts so desperately need. We need you to pick up the phone and call your representative to demand that all of our children deserve a fair and equitable investment in their futures! Click here to find the phone number for your state representative. Make the call using the script below, and then fill out this form on the right side of this page to let us know whether or not they will commit to support our students and our schools. Hi my name is [INSERT NAME] and I am calling to ask Representative [INSERT REPRESENTATIVES NAME] to sign onto Representative Vega’s letter asking the Chair of the House Rules Committee to move the S.2525 bill favorably out of committee and to take the bill to a vote in the House. It is critical that the House pass this popular piece of legislation after the Senate unanimously passed S.2525. My district school [INSERT DISTRICT SCHOOL] is in dire need of fair and equitable funding in order to build the schools our community deserves.